There’s nothing like a heated pool after a day on the slopes. Challenge the family to a game on the resort’s private beach. Lodgepole Pine furnishings in all condos provide a cozy atmosphere for your family. Fully equipped kitchens allow you to eat dinner together every night. Franciscan Lakeside Lodge is right on Lake Tahoe providing direct access to the best watersports. The resort's beautiful surroundings provide the perfect atmosphere for a romantic honeymoon. Get your snacks ready and challenge your family to a hike. Brockway Summit Tahoe Rim Trail is just a 6 min drive from the resort. Grab your clubs and go. Old Brockway Golf Course is just 1 mile away. 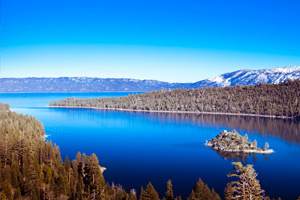 Franciscan Lakeside Lodge is located on Lake Tahoe’s North Shore near the area’s best attractions. Whether you visit in summer or winter, there will be no shortage of excitement. Once you get here, shift into full vacation mode. The views are definitely worthy of Instagram – and the annual Holiday card. After a morning on the slopes, head back to the resort for an afternoon time-out in the outdoor heated pool. Set up camp poolside with that book you picked up at the airport gift shop and relax; you deserve it. After the pool, challenge the kids to a game on the volleyball court at the resort’s private beach. When the little ones get hungry, take advantage of the BBQ grills and have a family cookout. Let the kiddos carry burgers, hot dogs and sides while the grownups handle the condiments, plates and utensils. Lakeside or Mountainside Studio condos sleep two guests while Lakeside Large Studio and Mountainside One-Bedroom condos sleep four guests. All condos feature rustic Lodgepole Pine Furnishings. Fully equipped kitchens with a refrigerator, microwave, stovetop and oven allow you to save money by making your own meals. Bring the kids along to Safeway to make sure that no one’s favorites are forgotten. When you return from the store, whip up a batch of your famous sugar cookies (the kids should be more than willing to assist). Put the cookies in the oven and take a few minutes to clean up the sugar explosion in the kitchen; the dishwasher will be a big help. Once the cookies are ready (and have cooled off), gather everyone on the couch and watch a sitcom rerun on your Flatscreen TV with cable. Franciscan Lakeside Lodge has its own private beach. Have the kids grab their shovels, hats and buckets and get ready to be amazed by their sandcastle building skills. The resort is just a short drive from Tahoe Regional Park. It’s a one-hundred and twenty-four-acre park with hiking and biking trails, sledding and snowmobiling. Kids aged five through twelve will love the playground. It features slides, hanging bridges, spring rider play equipment and swings for both little ones and big kids. Get in touch with your athletic side at the five tennis courts. Tree Top Adventures features seventy tree platforms connected by zip lines and bridges with courses for all levels from beginners to advanced. Everyone who participates wears a harness and is connected to a safety cable. Surprise the kids with a visit to Kings Beach Miniature Golf. It features two 19-hole mini golf courses for hours of fun. Incline Village is less than seven miles from the resort and is home to the Lake Tahoe Shakespeare Festival. The festival began in 1972 but has been at its current home since 1976. Past shows include The Comedy of Errors, Much Ado About Nothing and A Midsummer Night’s Dream. Treat the kids to a day of bowling at Bowl Incline and Arcade. It has sixteen lanes with automatic scoring, lightweight bowling balls for children and bumpers if needed. Northstar California Ski Resort features skiing for all experience levels from beginner to advanced. Stock up on gear and apparel at The Village at Northstar. Butterbox features snowboard apparel, accessories and equipment. Elite Feet offers custom ski and boot fitting. Head to True North for premier ski and fashion apparel for women and men. Little ones will love the toys, games and books offered at Ambassador Toys. - The front desk is open daily from 9:00 AM - 9:00 PM. To make arrangements for check-in please contact the property at least 24 hours before arrival using the information on the booking confirmation. From boating on Lake Tahoe in the summer to shredding the slopes in the winter, this former gold-mining hub is an outdoorsman's paradise. With Northstar and Sugar Bowl to the north, Diamond Peak and Mt. Rose to the east, and Homewood to the west - there's no shortage of choice skiing.